The gold rush is on! While Latinos began gaining traction online about five years ago, new websites have multiplied exponentially in the last year. They’re primarily in English and they include portals, blogs, news aggregators, and even discount coupon sites. The trend is an exciting one that’s been made possible by a variety of factors, including the shrinking of the digital divide and the increasing realization of the growing demographic clout of the Latino community, according to Sandra Ordonez, a self-proclaimed “web astronaut” who’s studied social media and provided marketing consulting for both mainstream and Latino-centered websites. My Latino Voice has been successful, growing to 300,000 unique visitors per month. The majority is young (between 25 and 34 years old,) has at least some college education, and earns between $40,000 and $75,000 a year. Ordonez attributes its success to the constant adjustments it makes to better meet the needs of its audience. For example, in its three-year lifespan, My Latino Voice has rebranded from Mi Apogeo, started featuring YouTube videos and launched WikiLatino----a Latino-centric wiki page. It also has a Facebook-like social media feature where readers can create their own profiles and connect with others on the site. Other sites launched in the last year include NewsTaco, a news aggregator and blog site; Latino Briefing Room, featuring opinion pieces and political news; and Mamiverse, for Latina mothers and daughters. They›ve followed a similar model, targeting acculturated Latinos with content in English. This is supported by a 2010 study by the Pew Hispanic Research Center, which found that 65% of Latinos go online. Of these, only 47% of Spanish-dominant Latinos use the internet, as oppposed to 81% of English-dominant ones.. When Sara Inés Calderón and her colleagues at NewsTaco launched last fall, they set out to become a one-stop-shop for Latinos on everything from technology to immigration. “We’re all Latinos and we grew up eating tacos,” said Calderón, the site’s editor in San Antonio. “The idea was, why don’t we have an intellectual counterpart to that kind of sustenance? Where’s the website, where’s the news source for us as educated, as English-dominant, as acculturated Latinos?” NewsTaco celebrated its one-year anniversary Oct. 10 and has grown to about 20,000 unique visitors per month. Also based in San Antonio but with a strong Washington, D.C. presence, Latino Briefing Room started last fall when editor Joe Cox and his partners noticed the need for a comprehensive collection of information on commerce, politics and government geared toward Latino professionals. The idea stemmed from the daily briefs co-founder Leonard Rodriguez used to provide the Bush administration as director of Hispanic outreach. Another is Mamiverse, which launched in July and features articles and blogs primarily for and by Latina mothers on topics such as preventing childhood obesity, saving money on quinceañeras and raising boys as a single mother. Among the bloggers is model and TV star Daisy Fuentes. “Our goal is to inspire Latina moms and to celebrate them,” said Sylvia Martinez, Mamiverse’s vice president and digital content director. The site›s founder is Rene Alegria, former publisher and editorial director of Rayo/Harper Collins, who recognized Latina moms as “the pillars around which our families are built,” according to his August guest blog on Latinovations. In the first month, the site’s audience doubled to nearly 20,000 unique visitors, she said. And Target recently began advertising with Mamiverse. Following in the footsteps of Groupon is Descuento Libre, which features bilingual deals on products and services hand-picked for Latino consumers. Descuento Libre went live this year and offers local deals in Austin, Chicago and Mexico City as well as national deals throughout the U.S. and Mexico. It was the first deal site to cater specifically to Latinos. The new crop of Latino-focused sites relies on a combination of revenue models. Like many startups, most obtained their initial funding from private investors. But going forward, they’re having to be more creative than mainstream news sites, which rely primarily on advertising revenue, to pay the bills. Like many of its counterparts, NewsTaco earns money from a combination of advertising, reader donations and partnerships with other media such as Descuento Libre, Calderón said. My Latino Voice has created a hybrid model. In addition to advertising, the site also partners with corporations looking to sponsor series and contests, Alonso said. For example, Verizon Wireless recently sponsored its Hispanic Heritage Series, and Heineken sponsors its series on Latino deejays. 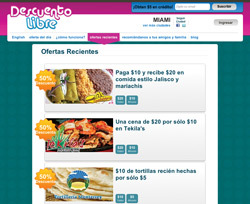 Descuento Libre takes a cut from the total its subscribers pay for each deal. While the vendors typically lose money on the transaction, they make it up by building customer loyalty, Portman said. But they’re also exploring alternative revenue streams and partnerships with other Latino media. But the new sites face stiff competition from mainstream media---with their wealth of assets and advertising clout---that have decided to try to carve out their portion of the Latino audience by launching their own Latino-centric sites. They include Fox News Latino, started last fall, and The Huffington Post’s Latino Voices, started in August. In Washington, D.C., last summer, Arianna Huffington, president and editor and chief of the AOL Huffington Post Media Group, offered the keynote address at the National Council of La Raza’s Latinas Brunch, which focused on women in media. As a Greek American, she spoke of the common denominators between immigrants of different backgrounds, according to an article on the speech by Angélica Pérez-Liwin, publisher and chief executive officer of the website New Latina. When Latino Voices launched, Huffington called it a “truly Latino moment.” But in a scathing editorial in The San Jose Mercury News in August, syndicated columnist (and LATINO contributor) Ruben Navarrette, Jr. didn’t buy it, saying Huffington and her staff “should be ashamed” for looking to profit from Latinos by segregating them rather than diversifying their staff and coverage. Navarette also said Latino Voices’ coverage thus far seemed to reflect only a shallow, generalized understanding of the Latino community, rather than portraying its complexity. Alonso, of My Latino Voice, agreed. “I don’t consider them competition to be perfectly honest,” she said. “We’re not competing with those people. In many cases, we look to work with them.” According to Ordonez, collaboration will draw more Latinos online, where they’ll engage, spend money and help shape the overall dialogue. “If we all got together to share the market instead of all competing for the same piece of the pie, we could all grow the market together,” Alonso agreed. Whether the Latino niche sites will survive is a matter of how unique and relevant they can be, said Juan Tornoe, founder of Hispanic Trending, a blog that tracks trends in Latino marketing and advertising. For example, “Why would Latinos subscribe to a Latino-only social networking site when they can use Facebook?” Tornoe asked. And Latinos don’t add the word Latino to their searches online, so Latino-centric sites have to feature content that will pop up in their results organically. “You have to really, truly be able to provide a product, a service, an experience that is not obviously Latino but takes into consideration the wants and needs of the Latino community,” Tornoe said. While enthusiastic about their cause and optimistic about their viability, it’s too soon to tell which sites will succeed, especially for those still in the startup phase. Sites such as Descuento Libre may have a hard time being unique enough to compete, Tornoe said. Some have already dissolved, but sites such as NewsTaco seem compelling enough to endure.